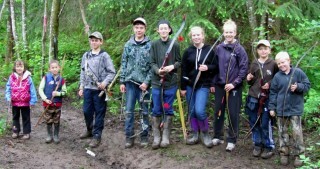 The Bulkley Valley Bowmen enthusiastically promotes the sport of archery. Membership with the BV Bowmen provides a high-valued recreational experience, as the archery range is located in a very scenic setting along the Bulkley River. Membership is open to everyone. BCAA membership is required for insurance purposes and fees are separate from club fees. BCAA fees can be paid through the BCAA website. Club fees can be made payable to Bulkley Valley Bowmen, forms and payments can be submitted at Glacier Toyota, Helix Communications & Energy or collected during club events. When shooting on the archery trails, there is not walking back on the trail for safety reasons. Please follow the posted arrows for the direction on and off the course.